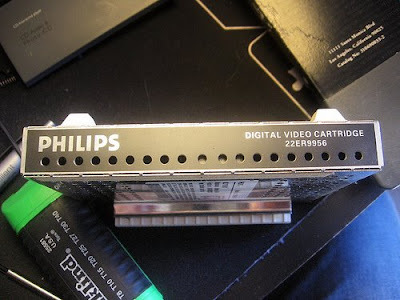 The Digital Video cartridge is en expansion unit that can be inserted in most CD-i players which make the player capable of producing full motion video. It's a 32 bit risc processor (the cd-i itself is 16 bit). Some CD-i games use digital video (=full motion video) to make the game more graphically enhanced. Moreover it allows the player to playback video cd's. The version of the cartridge is indicated by the number behind the slash. An increment of 20 means a complete new version occupying a new chipset. 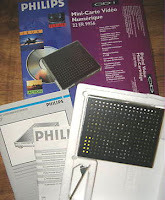 The 22ER9143 was only used as a prototype cartridge for demonstrations and early authoring, since it does not contain the extra 1MB of main RAM. It is not sold onto the consumer market. The AH indication is a further refinement of indicating a particular version of a /00, /20 or /40 edition. An increased AH number does not refer to a different chipset, but usually indicated a ROM or firmware update. A CDI Digital Video Cartridge is capable of showing moving MPEG video in a resolution of up To 384x288. This will then fill the entire screen. However, the MPEG video stream on a Video-CD is only up to 352x288. This would mean that there will be small black bars at both sides of the screen. To accomplish for this, the cartridge was modified to display slightly larger pixels when a White Book Video-CD stream was detected. Note that old cartridges can also play back White Book discs, but that the image does not fill the entire screen in this case. The chipset indicates which MPEG decoding chipset is used. The Gate Array 3 is used to have some decoding problems, for example resulting in the display of green spots or "ghost sprites" in the image. Therefore, a new version of the 22ER9141 cartridge was released (22ER9141/20). The "I" in IMPEG stands for integrated, since the audio and video decoding chips are integrated in one IC in this version. Extra memory: The Digital Video cartridge offers 1MB extra memory used in some CD-i games like The Apprentice, Microcosm and Atlantis: The Last Resort. The extra memory allows for instance to use both sfx and music at the same time. In games like Christmas Country it was used to preload the levels for a smoother gameplay. To check what kind of digital video cartridge your player needs: Check the comparison table of consumer CD-i players here. To check if a CD-i title requires a Digital Video Cartridge: check the bottom line on the front box. It either sais 'compact disc interactive' (no DVC needed) or 'Digital Video on CD-i' (needs DVC). It not 100% waterproof and it's a little misleading too; but it's a start. CD-i Emulator vs CD-i player - Which to choose?